Before starting this blog I had not had any beer by Harpoon Brewing. Each variety from Harpoon seems to be a quality offering and overall they are certainly a top notch brewer. This IPA is a quality beer but I prefer most other types of beer to IPAs. IBU rating is lower than many IPAs, color, aroma, etc are all about the same. 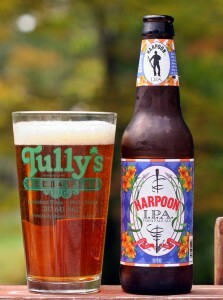 Overall if you enjoy this style of beer you will like this offering from Harpoon but for me it is “just another IPA”. Brewers Description: The high hopping of Harpoon IPA is not only noticeable in the nose but especially in the finish. The lingering bitter finish of this beer is not harsh or astringent, but crisp and pronounced. This is created, in part, by dry hopping – a technique that involves adding fresh hops to the conditioning beer to provide a fresh hop aroma. This beer is floral, medium body with an aggressive, clean hop finish.